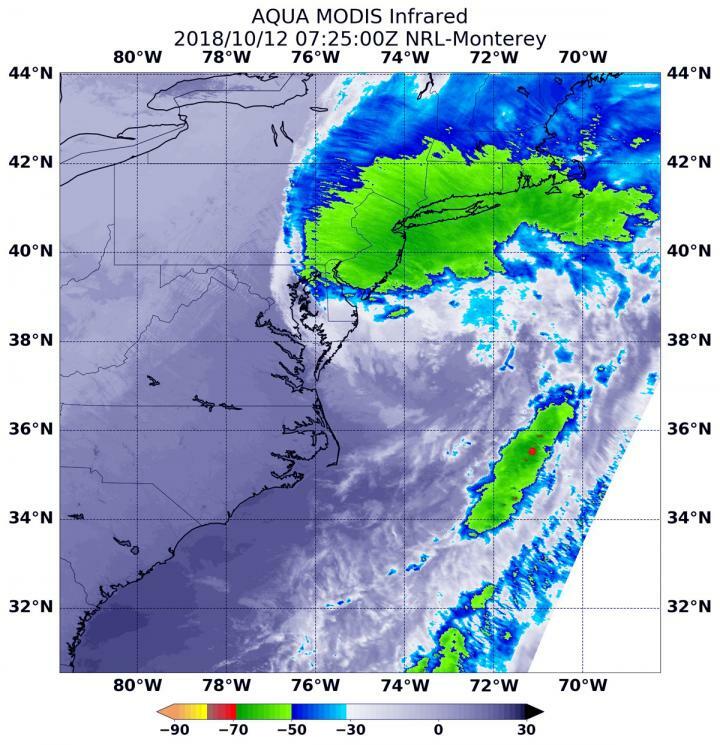 NASA satellite imagery showed that although Michael's center was off-shore of the Delmarva Peninsula and over the western Atlantic Ocean, rain from its western quadrant was affecting the northeastern U.S.
At 3:25 a.m. EDT (0725 UTC) on Oct. 12, the MODIS instrument that flies aboard NASA's Aqua satellite gathered infrared data on Post-Tropical Cyclone Michael. Infrared data provides temperature information. Strongest thunderstorms appeared over eastern Pennsylvania, New Jersey, southeastern New York, Connecticut, Rhode Island and Massachusetts. In those areas, storms had cloud top temperatures as cold as minus 63 degrees Fahrenheit (minus 53 Celsius). NASA research has shown that cloud tops with temperatures that cold were high in the troposphere and have the ability to generate heavy rain. The Global Precipitation Measurement mission or GPM core satellite provided an analysis of the rate in which rain is falling throughout Post-Tropical Cyclone Michael. The GPM core satellite measured rainfall within Post-Tropical Storm Michael on Oct. 12. GPM found the heaviest rainfall was north of Michael's center, falling at a rate of over 1.6 inches (40 mm) per hour south of Long Island, New York. The National Hurricane Center or NHC noted at 5 a.m. EDT (0900 UTC), the center of Post-Tropical Cyclone Michael was located near latitude 38.0 degrees north and longitude 73.1 degrees west. Michael's center was about 185 miles (300 km) east-northeast of Norfolk, Virginia. The post-tropical cyclone is moving toward the east-northeast near 29 mph (46 kph), and this motion is expected to continue with an increase in forward speed during the next couple of days. On the forecast track, the center of Michael will move away from the United States today and move rapidly across the open Atlantic Ocean tonight through Sunday. Maximum sustained winds have increased near 65 mph (100 kph) with higher gusts. Some additional strengthening is expected today and tonight as the post-tropical cyclone moves across the Atlantic.